There’s no denying that San Diego is the perfect city for backyard swimming pools. Year-round warm weather makes it so. But the idea of adding a pool to your yard may scare you a little when you consider the process from design to completion takes a minimum of two months and can cost up to $100,000. Get to know what’s out there. 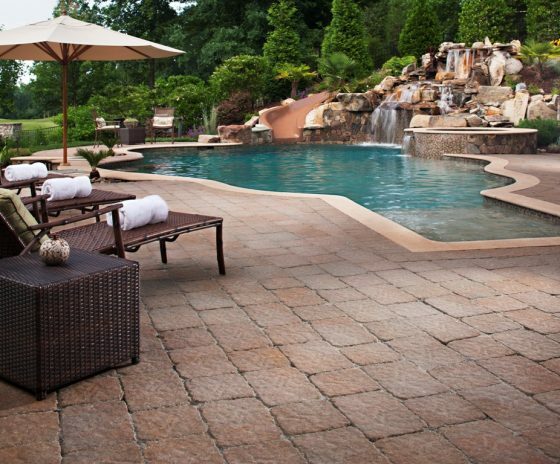 Definitely start your dream list of pool features by investigating the latest technologies, styles, and materials. A simple Internet search will turn up a list of links to work your way through and give you a sense of what other people are building and the different looks available. Start a simple portfolio of pools designs you love. 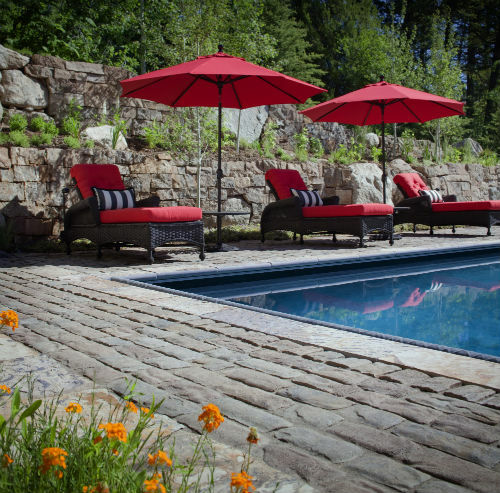 Houzz publishes a nice selection of pool looks and so do many other home and garden design sites. Also, browse Pinterest and the websites of pool builders around the country and print out photos of installations you dig. Take pictures of friends’ and neighbors’ pools you admire and then show it all to your pool builder so he or she can make your vision a reality. Also keep in mind what you’d prefer for decking, entertainment space, water features, lighting and more to provide a starting point. These preferences may change, but at least you’ll have a solid idea of what you do and don’t want. You know what you like. If your house has more of an organic or traditional design, more natural-looking pools with flowing lines will complement your outdoors the best; if you live in a modern house, you’ll probably want to go with a contemporary pool with clean, straight lines. If you have a sophisticated sensibility, an elegant pool (think rectangular with round edges a la Grecian pool), then choose that design as long as it harmonizes with your existing home and living space. Also look around your yard. Properties with full-grown trees and a lot of landscaping may call for a natural-style, less severe-lined pool. If you’re starting with a clean slate, you may opt for a modern pool look that you’ll complement with landscaping later on. Give some thought to placement. How far from the house do you want the pool? 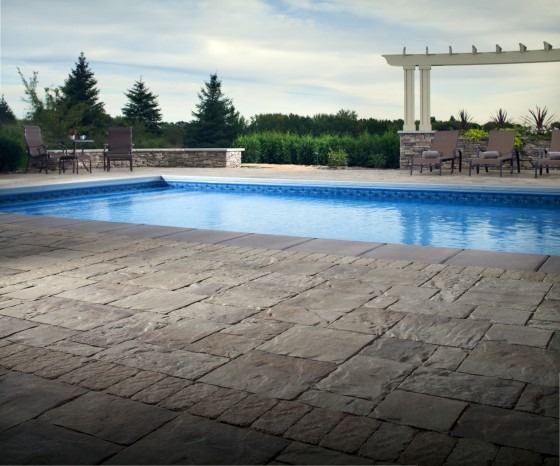 Is there enough room to accommodate entertaining space and landscaping around and behind your pool? Some pros recommend that you “lay” your dream pool out in your backyard using flexible garden hoses to assess how much space the pool will consume and if it’s in scale to the rest of your yard. Remember that the actual pool will be bigger once the hole is dug, but the garden-hose technique can give you a rough idea of placement. When doing this, remember that a “typical” pool measures 30-‘ x 15’ (400 square feet), which is what many pool contractors will offer as the basic package, while custom designed pools will obviously vary. Decide who will build your pool. Unless you’re a contractor yourself, you’ll probably want to hire someone to build your pool for you. If you’re starting fresh with your backyard, a landscape architect can do a master design of your backyard incorporating a pool and water features, and may have a pool contractor to recommend. Otherwise, ask friends, check pool builder associations, and cross reference all referrals with the Better Business Bureau. When you’re building a swimming pool, the contractor’s license should be in swimming pool construction. Before hiring any contractor, ask for his or her license number and visit the California Contractors State License Board website to verify that the license is in the right specialty. Check out our 10 Tips to Hiring a Good Contractor for more guidelines. Furthermore, your contractor/pool builder should be familiar with all local building department requirements and regulations, which will save you valuable time and possible mistakes. You can go totally Hugh Hefner here if you want, or keep it simple. Common water features include waterfalls, slides, and caves. There’s also grottos, “gushers,” sheer descents (water flowing out of a higher sheer tile wall), spouting pool wall sconces, bubbling fountains and everything in between. 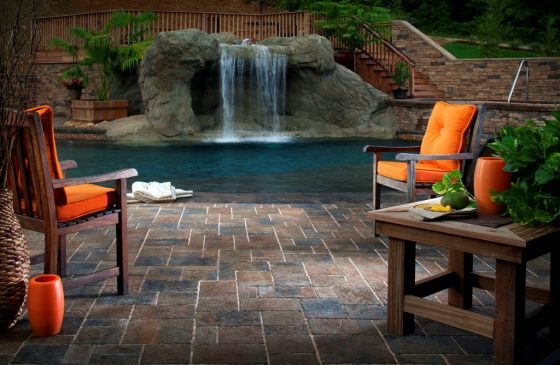 Check the aforementioned Houzz for some additional cool water feature ideas. Increase the drama of your pool with underwater lighting, colored LED lights, floating lights, or fiber optic lighting around your pool’s borders. Solar lighting is also a nice option and environmentally friendly. Remember too that lighting increases safety around the pool so you’ll want to incorporate “being able to see” in your lighting plans. 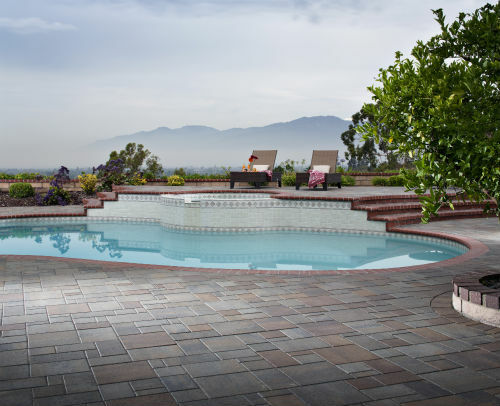 Some popular pool deck options include stamped concrete, concrete pavers and exposed aggregate, which has a pebbly texture that is an effective anti-slip deck material. Decorative concrete decks can be colored and textured too for safer decking. 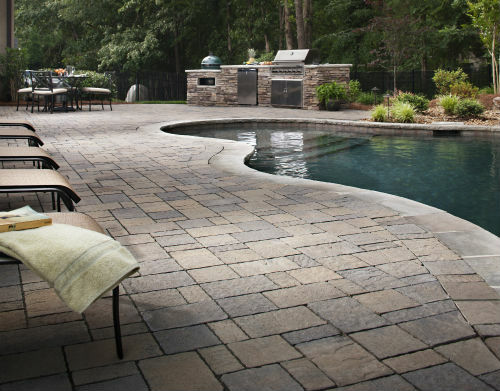 Other decking materials include stone, ceramic and glass tile. Each has its own pros and cons, so be sure to discuss it all with your designer and/or pool contractor. Also, choose complementary materials. Decking will harmonize – or compete with – your landscape and so you want to plan to use materials that blend with your home’s landscaping. Finally, when you’re considering decking, be sure your designer or contractor allows for enough of it around your pool to give you enough spaces to entertain and relax. From beginning to end, the design-to-completion process takes at least two months. When your pool is being designed, a lot of thought should be given to ease of use. For instance, pay attention to the direction the wind blows into your yard most of the time. This will inform where the skimmer is placed in your pool to collect debris. If the skimmer is placed in the right spot to “catch” the wind’s debris, it lessens pool dirtiness. Also, if you have a water feature that causes rippling in your pool, the current will “push” debris in a certain direction. Placing the skinner opposite of the water fall or other water feature will keep your pool cleaner. Speaking of rippling, have your designer try to avoid “dead spots,” which are sharp corners in the design that “hold” static water. You want to keep everything fluid to avoid debris collecting in these dead spots. After your pool is installed, you’ll need to regularly buy chemicals to keep the water properly balanced. And if you want to avoid chlorine, invest in a filtration system using salt or bromine. You’ll also have to vacuum your pool often to remove leaves and dirt if you don’t invest in a robotic cleaning system. In addition to maintenance costs, adding a pool can increase your annual property taxes, so be sure to budget for that added expense. Pools also may or may not increase your property value (depends on the neighborhood, buyer preferences, and pool age) so keeping the construction cost of your pool to 10-15% of your home’s purchase price is a good rule of thumb. You may also want to increase your liability insurance, which is another expense to assess. A swimming pool is an ideal addition to most backyards. However, planning for and building said pool can be a time- and money-intensive project. Do some research and choose trusted professionals for the job and it will pay off in the end. Enjoy that pool! What are some of your favorite pool designs?